IWW Secures Hour-Long Breaks for Hotel Workers in Warrington! On Friday 13th July, Front of House workers at a hotel in Warrington were called into a general monthly meeting with management to discuss new policies and workplace regimes. By working together, the IWW were able to secure hour-long breaks for workers on 12 hour shifts and present a series of further demands to management to rectify some of the issues affecting members of staff. The provision of adequate/healthy/nutritious food in the staff canteen that is supposed to be offered as part of the employment package. Presenting these as collective issues, we were able to win a commitment to the provision of hour-long breaks on 12-hour shifts there and then! In relation to the other issues, we have asked that these issues be raised with the higher echelons of hotel management and that the response be fed back to the workers in due course. Our next step is to await feedback from management and decide on further action should these issues remain unresolved. 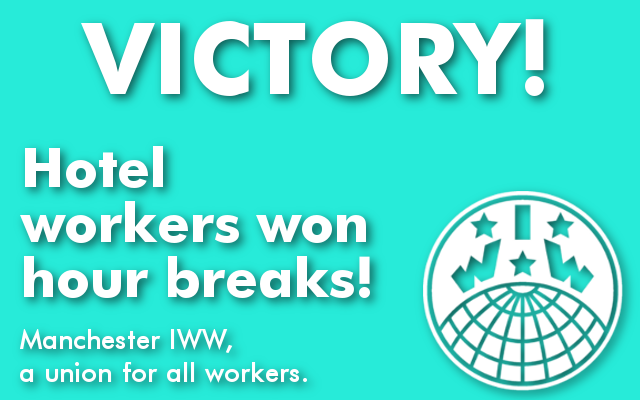 This win, and the demands the IWW members have presented to management are showing staff at the hotel of the power of collective action and we are expanding our presence in the hotel across other departments – the management better watch out, the IWW is on the march! !